If you are looking for a way to make a delicious fermented food snack right in your own home, one of the easiest way to do it is to make some sauerkraut. If you are wondering what the benefits of this cabbage-based treat are, look no further. Before we break down a quick recipe for the stuff, let’s go over what you stand to gain from making sauerkraut or similar probiotics a part of your regular diet. There are quite a lot of benefits thats probiotics can offer to your gut microbiome and the rest of your body. In fact, there are many benefits that researchers have not even discovered yet! It is quite an exciting time to be a part of the world of research regarding probiotics. Probiotics can help prevent and treat diarrhea. Probiotic supplements improve some mental health conditions and can reduce anxiety. Certain strains can improve your heart health. Probiotics can reduce the severity of allergies and skin irritation. 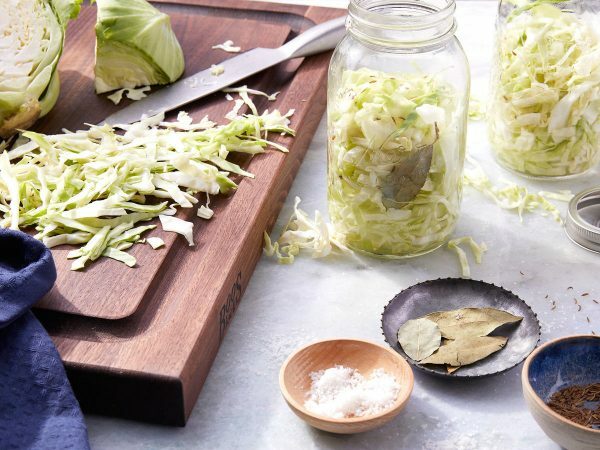 Once cabbage has been fermented, the combination of salt, acid, and preserving bacteria, means that it can keep almost indefinitely in cooler temperatures (like in your fridge). It’s ability to maintain fresh made it an incredibly valuable asset in the ancient world and was used by Tatar and Roman soldiers, as well as sailors to prevent scurvy due to a lack of vitamin C.
Sauerkraut is full of probiotics that can help strengthen the health of your gut and can have benefits that range from…well you already know! This sauerkraut recipe is incredibly easy to make. In fact, all you need is cabbage and salt. You can add other spices and a few other vegetables, but it is not necessary. One important thing to keep in mind is that the salt you use does not include any anti-caking additives or iodine. This excludes regular table salt. The best kind of salt to use is likely unrefined sea salt. Another thing to make sure is that when you submerge the cabbage (or other vegetables you use) into your liquid, make sure that it is completely submerged. That way, you ensure that it will not mold. In fact, it is useful to have a weight to make sure that the cabbage stays down. You can lay a large cabbage leaf over top and weigh town your shredded cabbage with a small jar filled with water, a clean stone, or pottery weights. While you may have read elsewhere that you require an airlock fermenting jar, but that is not necessarily the case. Think about it, it’s not like the Ancient Chinese or Ancient Romans were using air-tight jars to create their fermented foods, and you don’t have to either. Feel free to start out with mason jars, they’re perfectly fine with it comes to starting out your life as a fermenter! This recipe is about as easy as it gets, all you need is four ingredients. Here is a quick step by step guide to making sauerkraut of your very own. Slice your cabbage thinly, done with either a knife, mandolin, slicer, or a food processor. For each kilogram of cabbage, mix with 20 grams of salt. Or for every pound of cabbage, mix with 9 grams of salt – about 2 teaspoons. Toss the cabbage and salt with your washed hands so it is spread evenly across the entire cabbage. Massage the cabbage with your hands. This encourages more of the liquid in the cabbage to come out. Once the cabbage is sufficiently drained, add the bay leaves (about one leaf per pound of cabbage) and the caraway seeds (about 1 teaspoon per pound). Pack the entire mixture, cabbage, liquid, and all, into your jar. The best way to do this is to scoop it up by a spoon or hand and pack it down with your fist, a pounder, or the backend of a wooden spoon. Once the cabbage is fully packed, make sure there is a enough liquid to cover the cabbage by at least an inch. Weigh the cabbage down if necessary. Put a lid on the jar, and keep an eye on the jar you may have to slightly ‘burp’ the jar during the fermentation process to allow the C02 to release. Make sure to keep your cabbage out of direct sunlight during the fermentation process and let it sit for 4-6 weeks. Four weeks 4 weeks is the minimum required for the full cycle of probiotics to develop. Precise fermentation times will depend on both the temperature and what you want your sauerkraute to taste like! Once the 4-6 week period ends, store your fermented sauerkraut in the fridge to slow fermentation.